In theory, I should've loved the hell out of King of Fighters XII. I'm not going to say that KoF is my favorite fighting franchise (that'd be Soul Calibur), but it's probably my favorite 2D fighting series. It's one of the last really arcadey brawlers that sticks with an old-school formula and is pretty simple to pick up and have fun with. I can't get that with Street Fighter IV, a game that virtually requires an arcade stick to be good at. I guess I like Capcom's Vs. series (most recently Tatsunoko vs. Capcom), too. Anyway, last year's King of Fighters XII revised the series by going back to 2D, but high-res, detailed, sprite-based 2D. It was a stunningly beautiful game, but very bare-bones and obviously a work in progress. It also didn't have Mai Shiranui, a staple of the series. 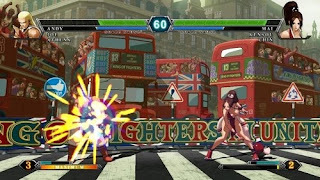 Frankly, I'm not going to buy a King of Fighters game that doesn't have Mai in it. Am I a bad person? Of course, that's not debatable. Well, King of Fighters XIII IS going to feature Mai Shiranui. And I'll probably buy it because of that. Also, on Wednesday, Dead or Alive: Paradise is coming to the PSP. Can't turn that one down. Not if I wanted to. All that matters is whether or not Terry Bogard is in it. I don't see how he could NOT be in it. Terry and Andy Bogard are basically KoF's Ken and Ryu. A lot of people, even my SNK loving friends, didn't like KoF XII so don't feel too bad about it.